The following changes to this program will come into effect as of April 1, 2018. Please review these changes so that you can incorporate them into your technology planning. These changes allow Microsoft and NASSCOM Foundation to continue to provide nonprofits with the technology they need to achieve their missions. o Certain on-premises software products from Microsoft will no longer be available through NASSCOM Foundation’s BigTech program as donated products. However, these products will soon be available through BigTech as discounted products for eligible nonprofits and libraries. o Eligible organizations will no longer be limited to requesting donated products from a maximum of 10 title groups during their two-year cycle. Instead, organizations will be able to simply request up to 50 of each donated product and up to 5 donated server products that don't use core-based licensing per two-year cycle. o The most popular on-premises software products from Microsoft will still be available as donated products to eligible nonprofits and libraries. o Request limits for donated products will still be reset every two years. o All other program rules, eligibility, and restrictions will remained the same. For more information, see the Microsoft Software Donation and Discount Program – Eligibility, Allotments, and Returns page. FluidSurveys, a web-based application for creating online surveys and collecting and analyzing survey data, is now available on the BigTech donations program for eligible non-profits, charities, and public libraries throughout India. FluidSurveys makes building, distributing and analyzing surveys easy, accessible and affordable. You can use FluidSurveys to quickly gather and analyze informal data through online surveys, forms, or polls. With a one-year subscription to FluidSurveys Pro your organization can create an unlimited number of surveys with an unlimited number of questions in each and to collect an unlimited number of responses per Survey. o Create surveys with a keystroke: The drag-and-drop interface lets you create and modify surveys and see a real-time preview of how it will actually appear. Your survey questions can be rearranged, copied and pasted, and moved from page to page or from one survey to another. o Give your survey the look you want: Your survey's color, font, and spacing can be customized as a whole or on a page-by-page basis. You can also upload logos, images, videos, or other rich media into a survey. o Choose from a variety of question types: Include everything from multiple choice and yes/no, to rankings, questions that allow a text response, and more. o Branching and skipping: You can direct survey participants to a specific question or page in your survey based on their responses to a previous question. o Straightforward results: You can view your survey results online in real time in table or graph form. Analysis tools allow you to filter results and create cross-tabulations to see how results compare. Both table and graph results can be exported as Excel spreadsheets, Word documents, PowerPoint presentations, Rich Text Format files, and Adobe PDF documents. o Multilanguage surveys: Survey creators can give participants the choice to fill out a survey in English, French, or Spanish. We are happy to announce stock clearance from the BiG Bridge computer donation programme! NGOs who want use computers in your offices and for your programs this is an excellent opportunity to avail affordable computers with licensed softwares. Donations of Office 2013 Are Now Available! Microsoft Office offers a number of new features and benefits over Office 2010, including direct integration with SkyDrive, new graphics options, the ability to open and edit PDFs in Word, and to sync across several devices. This means you can start working on a document on your desktop and then continue where you left off on another computer, laptop, or tablet because Office saves your work in the cloud as you go. If you have received a donation of Microsoft Office through BiGTech Donations Program that included Software Assurance (and it is still current), you can upgrade to the latest version of Office at no additional cost. One of the most interesting new features of Office is its integration with the cloud. Microsoft’s Office Web Apps let your staff and volunteers create, edit, and share documents online. For example, you can add comments to a Word document, and colleagues can respond to them directly within the document or via email or Skype. Plus: You can start working on a document on your desktop, then continue right where you left off on a different computer or tablet. One addition to Word that you’ll notice right away is its treatment of PDFs. For the first time, you can open a PDF in Word, and its paragraphs, lists, tables, and other content will act just like Word content. The latest version of Excel helps you explore your organization’s data in a more intuitive and visual way. Excel recommends charts and graphs for you based on the data you’re trying to display, and it allows you to display selected workbooks collaboratively via Lync. Plus: Excel learns and recognizes your patterns and auto-completes your remaining data without macros. As you build your slideshows, PowerPoint suggests variations on your color scheme and template while you are working and includes new tools to help develop and align text, graphics, and imagery. This updated presentation tool also includes an improved Presenter View and a PowerPoint web app that allows coauthoring of presentations by several people inside and outside of your organization. Your OneNote notebooks are now built to move with you, thanks to the new cloud integration. The notes you take on your desktop or laptop will be accessible from any other computer, as well as your tablet and smartphone. You can use OneNote Mobile apps on Windows Phone, iOS, and Android phones. And if you are using a browser, just open the OneNote Web App. OneNote now also allows integration of pictures, video, and Excel spreadsheets into your notes. Plus: include links, webpages, maps, and sketches into your note taking as well. Outlook features new and improved ways to handle your email accounts, coordinate staff and volunteer schedules, manage your social networks, and keep yourself organized through to-do lists. The new version of Outlook also includes “Peeks” — which let you take a quick glance at your schedule — as well as a calendar sharing function so others can see when you’re available. Another neat new addition to Outlook is the weather bar, which lets you view the forecast right within Outlook, helping you plan your day and any upcoming travel. Eligible organizations can also request donated upgrades of Windows 8 Professional and Windows 8 Enterprise. With a new mobile-friendly design that features sleek tiles in the place of conventional icons, Windows 8 is a complete rethinking of the Windows environment. It keeps some aspects of what we are all used to from Windows 7. But it drops the “Start” button in favor of a new app-integrated look and makes it easier to sync with cloud-based services. What we did for the 'Joy of Giving' week? giving back.. IT style! One thing we maintain at NASSCOM Foundation is that ‘giving back’ is most effective when it is the core competency of the volunteer that she provides to the beneficiary. So when we sat to design an event for the ‘Joy of Giving’ week, we concluded with the idea of ‘Find an IT Partner’ Event for NGOs wherein NGOs across Mumbai could team up with with IT volunteers. 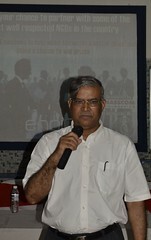 Our host and partner for this event held on 3rd Oct. 2012 was Don Bosco Institute of Technology (DBIT), Mumbai. This enabled the opportunity for IT students of DBIT to hone their professional skills in a live environment and to imbibe in them a culture of volunteering for social good. Prior to the event, about 20 NGOs had registered with us along with details of their IT needs which varied from being as simple as troubleshooting the website to as complex as creating an management information system for organizations spread across India. 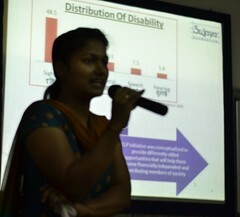 After a brief introduction and welcome note, each NGO presented their project(s). FPAI, Sujaya Foundation, Salaam Baalak and Maharashtra Dyslexia Association were among the total 12 NGOs that were present. 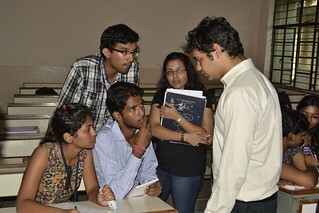 The students zealously listened and then formed groups based on their interests to service the different projects. The student groups are to be mentored by the Comp Sci./IT faculty of DBIT with project timelines ranging from three to six months. As this was a pilot event for us, we hadn’t called in many IT corporates but had conveyed the idea to a few. 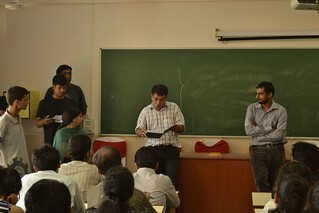 Mr. Deven Shah from Iris Business was present for the entire time and will be contributing to two of the NGOs. Other corporates such as Cognizant, Mphasis, Mastek, etc. too have shown interest. So don’t be surprised if you see us organizing another one sooner than the next Joy of Giving week. 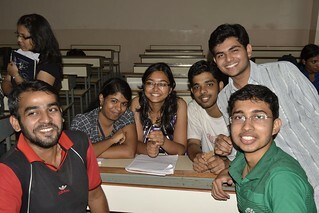 Next step for us is to work with the NGOs, DBIT faculty and students to scope the projects and plan towards deployment. Watch this space to know more about each project experience and results. Picture abhi baki hain! "Anyone with experience in the voluntary sector know that one of our biggest limitations is that our administrative systems don't always keep pace with our field activities. 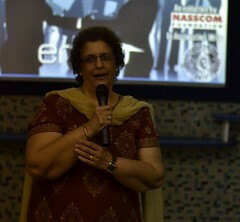 ..NASSCOM Foundation's 'Find an IT Partner for your NGO' Event yesterday hit the sweetspot exactly. .. 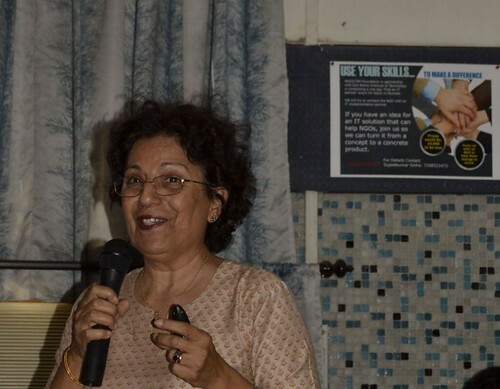 Thank you for bringing us a JGW event that will continue to spread benefit and goodwill for way beyond this week, " says Kate Currawalla from Maharashtra Dyslexia Association. Fresh from the ConnectIT workshop held from 26-28 Sep, Ms. Zarine Gupta Trustee, Salaam Baalak Trust said "Let me take this opportunity to thank Prashant Pandit who showed great leadership qualities in coordinating and networking with all partners and the NASSCOM Team for taking valuable time of their busy schedule and imparting the IT skills training for NGO's. It was a great learning opportunity for us and hope to put all that we have learnt into practice at Salaam Baalak Trust, Mumbai. This is a great achievement for all of us and I am sure a great CSR activity for NASSCOM ". A hearty thanks to all who participated in the event either by bringing their projects or by volunteering to work on those projects. We hope this small event shall scale up to the point where each IT professionals shall work hand in hand with the developmental sector of the country. What is GDPR? The General Data Protection Regulation is Europe's new privacy law. It raises the bar for the protection of personal data, which is any data that can be linked to an individual. What does this mean to the average person or organization in simple terms? The GDPR imposes new rules on companies, government agencies, nonprofits, and other organizations. It imposes those rules, regardless of location, on organizations that offer goods and services to people in the European Union (EU) or that collect and analyze data tied to EU residents. The average person will have more explicit rights under GDPR to know who stores, processes, and has access to their personal data. Under GDPR, EU residents can request access to, rectification of, and deletion of their data. Organizations need to review their data governance practices, get rid of legacy systems that store unnecessary data, and delete data not collected as prescribed under the new GDPR rules. They also need to document appropriate technical and organizational measures and work only with reliable vendors or face high financial and reputational risks. How will GDPR impact my organization based in the U.S.? Many organizations in the U.S. do not operate or have business in the EU or process information of individuals in the EU. For them, the GDPR will not have an immediate impact. However, many other countries around the world are looking at the GDPR to be a basis for their own privacy laws and regulations. Microsoft believes compliance with the GDPR standard can be a best practice in data management of personal information. Why did the EU put GDPR into place? In Europe, privacy is a fundamental right, and the EU is dedicated to protecting it. The EU's operational philosophy is built on the concept that personal data belongs to the individual. This is different than how the United States operates, where information collected on an individual is seen as the property of the organization that collects it. Data breaches have become part of our everyday life. And Europe wants to lead the way internationally to require companies to be more principled and transparent around data use and invest in security and data protection. Any company or agency collecting or utilizing personal information may do so only if they have a lawful basis to process the information. Will other countries follow the EU and put similar regulations in place? The GDPR applies to anyone who provides goods or services to residents in Europe. Other countries are considering similar laws with some variations, as some countries consider GDPR overly prescriptive. Who will monitor GDPR compliance? The Data Protection Authorities in the member states, as well as the European Data Protection Board, will monitor GDPR compliance. When does GDPR take effect? It takes effect May 25, 2018. It has been made clear that there will be no enforcement grace period, as companies received two years' notice to prepare for the new regulations. What are the main requirements of GDPR? The GDPR requires enhanced security, data protection, appropriate technical and organizational measures, transparency, record keeping, accountability, and supporting data subject requests. It also requires a 72-hour personal data breach notification by data controllers to the authorities. Responsibility for data protection will be shared within organizations and with vendors, establishing a shared responsibility model. Organizations must know what and how personal information is collected and processed in their internal systems. Conforming to this rule will require executive awareness of how information collection and processing takes place and cannot be considered an IT or legal issue alone. Internal awareness and training will be key. How do I know if GDPR applies to my organization? What are risks to my organization if it doesn't comply? GDPR applies to any organization that operates within the borders of the European Union or processes the personal data of any person in the European Union. Failure to comply will expose the organization to legal and financial penalties from privacy regulators in the EU plus legal claims from individuals. Can Microsoft help us meet the requirements of GDPR? The final responsibility for GDPR compliance lies with the organization. It's up to nonprofits to determine what data will be collected, how it will be used, and who the people in the organization are who are responsible. It's also up to nonprofits to figure out how individuals can request their personal information and request rectification and deletion. However, Microsoft does provide a suite of tools to assist with meeting requirements. Our Azure cloud infrastructure has been designed with GDPR in mind and has the systems in place to assist in GDPR compliance. Our Office 365 E3 and E5 licenses allow for ease of data tagging and automatic identification of sensitive information even if the user does not know it to be. Finally, we have launched a GDPR compliance dashboard that can be used by organizations to monitor their own compliance. You can also visit the GDPR web page on our new Microsoft Trust Center website to learn more about how the features and functionality of Azure, Dynamics 365, Enterprise Mobility + Security, Office 365, and Windows 10 will enable you to meet the GDPR's requirements. What next steps I should take? Start by reviewing our Nonprofit Guidelines for Cybersecurity and Privacy white paper. From there, decide internally who will be responsible to assure compliance and the steps needed. GDPR compliance will not happen overnight with a final endpoint; it's a continuous journey. As the Microsoft Philanthropies humanitarian response manager, Cameron has the responsibility for coordinating across the company the provision of resources to external agencies providing humanitarian relief during sudden onset humanitarian disasters. As with others on the team, he also has a portfolio of other engagement areas with nonprofits to include awareness on data privacy and cybersecurity issues. Andrea Simandi was appointed to the role of European data protection attorney for Microsoft in February 2017. As part of Microsoft's European commercial legal team, she supports the company's enterprise customers in complying with the requirements of the General Data Protection Regulation and accelerating their digital transformation. BigTech is proud to announce our newest donor partner, Box.org. Box.org provides organizations with the Box file-sharing, content management, and collaboration service. See the Box.org Donation Program for details about this offer. You can use Box's cloud-based storage and collaboration tools to replace traditional on-premises file servers and traditional file-sharing processes. It also provides tools that facilitate program management, funding development, and global collaboration. If your organization works with sensitive data, Box also provides the administrative, technical, and physical safeguards to support your organization's compliance with HIPAA. Create a folder structure that categorizes your daily fundraising responsibilities. Eligible organizations can receive a donation of Box Starter Edition that includes 10 user licenses and 100 GB of storage space. These licenses are perpetual, meaning they never expire. You can upload and share files up to 2 GB in size with the Starter Edition. These organizations are using Box to more effectively carry out their missions. · Leukemia & Lymphoma Society: This organization used Box to more effectively raise funds for blood cancer research. Its employees use Box to share digital asset libraries and collaborate with third-party vendors. When raising funds at events in the field, employees use Box on iPads to share videos, PDFs, and presentations with potential donors. · Grameen Foundation: This global microfinance nonprofit improved collaboration across four continents with Box. Before using Box, it had problems providing access to shared servers and its intranet to field offices in South America, Africa, Asia, and the Middle East. It has integrated Box content with its Salesforce implementation. · Operation Hope: This financial literacy nonprofit uses Box as its primary content management system for all employees. Before Box, it had problems with employees accessing content because its internal servers crashed frequently. · Teach for America, The International Rescue Committee, and Kiva all use Box for content management and collaboration. Learn more about their stories and watch a video detailing their work on the Box website. · Team Rubicon, Habitat for Humanity Australia, and Beyond12 also use Box to achieve their diverse goals. Learn more about each of these organizations on the Box blog. Check out how other organizations are using Box to create positive change by reading success stories on the Box.org website.